If HAARTZ says it’s the best, you know it’s the best. 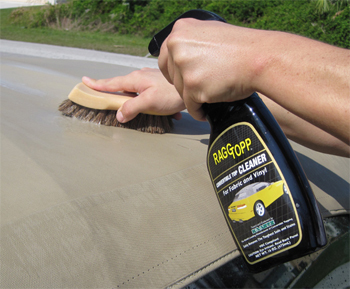 The RaggTopp Vinyl and Fabric Convertible Top Cleaner is backed by the foremost name in convertible top construction. 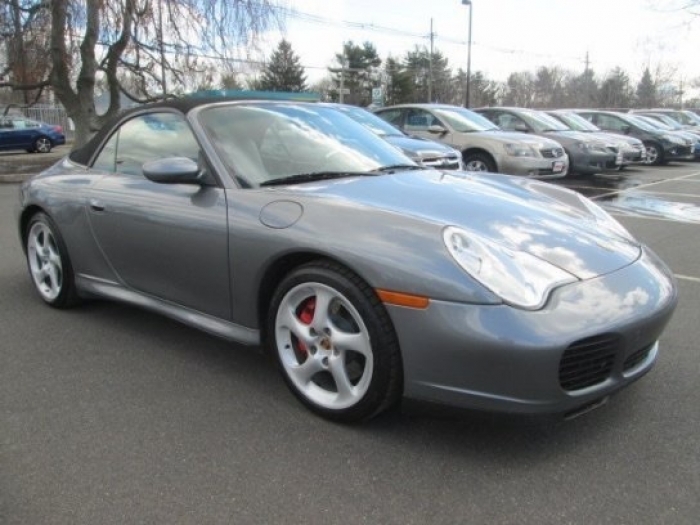 Perhaps you’ve never heard of HAARTZ, but we’re sure your convertible probably has. HAARTZ is the world’s largest manufacturer of convertible topping material. They alone have the capacity to cover every single convertible top in the world. They started in the 1920’s, alongside some of the first convertibles to enter the US market. You know a company must know their stuff if they are endorsed by HAARTZ. Enter RaggTopp, makers of the best-selling Fabric and Vinyl Convertible Top Cleaner. This pump spray cleaner is formulated exclusively for fabric and vinyl. Use confidently to safely clean convertible tops, sport utility tops, simcon tops and tonneau covers. RaggTopp Cleaner removes the toughest roof soils and stains, retards the growth of mildrew and will actually keep dirt and grease at bay. The anti-oxidant, low pH, no bleach formula leaves NO residue. The environmentally friendly & biodegradable formula will not harm autmotive finishes, chrome, rubber, glass, or plastic windows. Q: How do I clean my convertible top? A: Convertible tops are subjected to the same environmental conditions that nature and man places on your car's finish. The number one factor in deteriorating convertible tops is acid rain, U.V. rays, smog, gasoline, diesel fuel, jet fuel, tree sap, bird droppings, salt, tar, dirt and grit. RAGGTOPP™ Cleaner is the finest cleaner of its kind: a superior cleaner, environmentally friendly and safe to use. It's unique formulation will not harm paint or glass surfaces. 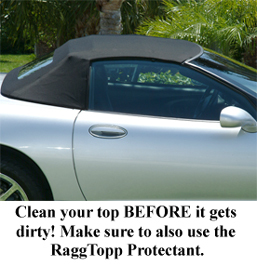 Simply follow the directions on the bottle and follow the cleaning with RAGGTOPP™ Protectant, a fluorocarbon re-water repelling system and your convertible top will look like new. Q: How do I Protect my convertible top? A: Although the fabric does not promote mildew growth by itself, mildew may develop on dirt and other foreign substances that are not removed. This is especially true in warm, humid, dark environments. A program of keeping the fabric clean through regular washings, BEFORE it gets dirty, will enhance the life and beauty of the acrylic and make successive cleaning easier. Most automatic car washes will not harm cloth top fabrics. Washes with water jets and hanging cloths provide a more gentle cleaning action. Those using heavy barrel brushes could damage the top material. Haartz recommends hand washing. Hand washing in shade or partial shade, not direct sunlight, is best. DO NOT USE DETERGENT. Bird and tree droppings, as well as other loose particle soils, should be removed immediately. Vacuum with a brush attachment and rinse thoroughly with water to remove loose particle soils. This will also prevent the soils from being redeposited during the cleaning process. Once the fabric has been rinsed thoroughly, spray RAGGTOPP™ Cleaner evenly over the entire surface while still wet. Allow the cleaner to soak for 10 to 20 minutes and then scrub lightly with a soft nylon brush or terry cloth rag. Rinse thoroughly, preferably until no remaining soap foam is observed. Additional cleanings may be required. It is best to determine the need for additional cleanings after the fabric has dried completely. For more stubborn cases, mix a solution of no more than 1/2 cup (4oz.) bleach and 1/4 cup (2oz.) RAGGTOPP™ Cleaner per gallon of water, soak for approximately 20 minutes and scrub lightly as indicated above. (Excessive soaking with the bleach solution can deteriorate seam threads.) Rinse thoroughly to prevent streaking on painted and chrome surfaces. Several cleanings may be necessary. Once dry, cleaning must be followed by re-water repelling with RAGGTOPP™ Protectant. (This product does not contain CFC's and therefore, is not harmful to the environment.) Failure to apply will result in rapid resoiling of the unprotected fabric. I have a cloth top and love the way this cleaner works. I also use the matching protection which really helps repell the water. My Three Year old Corvette Convertible Top looks brand new again! Works as advertised. I had not cleaned my top for over 3 years and it had a couple of stains. I really did not think the top was all that dirty except for these stains. Followed the directions and cleaned the fabric top using a horse hair brush and it was truly a simple operation and the results were stunning. Great product! ConsMy only con would be the fact you must thoroughly wash your car using soap after using this product, especially the windows, to make sure you the product is completely removed from paint surfaces and windows. Spraying water on the car and windows did not completely remove the product runoff and the windows had streaks. That's in bold type in the directions on the product which I missed. The cleaner worked very well. A lot of dirt washed away after scrubbing with product. The brush wasn't shipped with the cleaner so I had to call and get it shipped after I received the order this set me back about 3 days. When I got the brush it shed bristles so bad I didn't even use it. It may make a good fingernail brush. When I bought a cabriolet the care and preservation of the black fabric top became very important. I did a lot of research about which product to use and RaggTopp always was very highly recommended. I bought the cleaner, the special brush and the follow up RaggTopp protectant product. Used as a system these 3 products have my top looking like new. I'm now on my second cabriolet (again a black fabric top) and the RaggTopp products will be used on this top as well. ConsI haven't been able to buy the cleaner in a large size - I've only found it in a small size. I have been using RaggTopp Fabric/Vinyl Cleaner for 12 years. It has always performed as advertised. My convertible top always comes out looking like new. ConsI would like to see the manufacturer offer a large quantity refill.